Though we started as a Box manufacturing company, over the years we have expanded our product line to service clients in Food and Beverage industry. 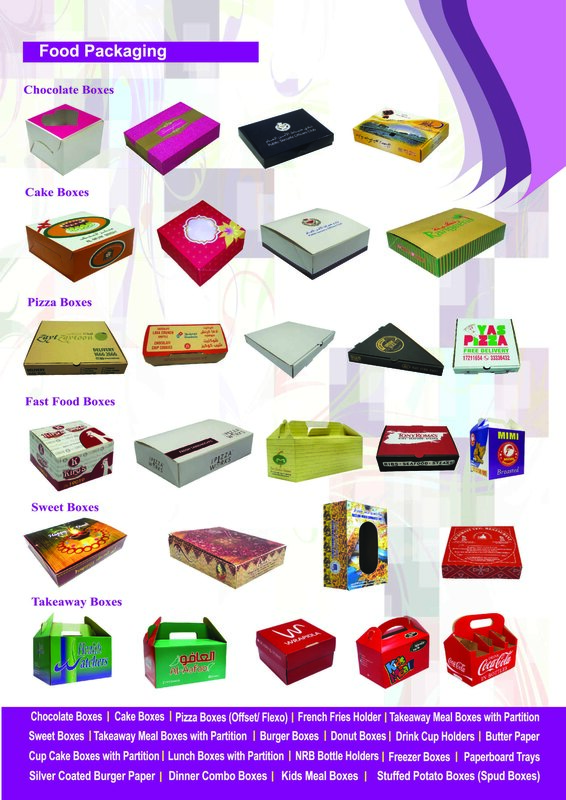 At Box Makers we can help you with various products such as Meal boxes, Pizza boxes (flexo/offset), Cake boxes, Cupcake boxes, Burger boxes, French fries holder, Drink cup holders, Paperboard trays, Donut boxes, Chocolate and sweet boxes, Freezer boxes, Popcorn cups, NRB bottle holders, Butter paper, silver coated burger paper and many other paper based food packaging products. Our current client base includes Restaurants, Bakeries, Caterers, Food Chains Companies, Cafeterias, Corporate and Government Canteens, Schools, Supermarkets, Retailers and Hotels. See below for a preview of some of our products.